Hurry'Cup is a family game, friendly where everyone plays cheerfully. We wish you a good game! 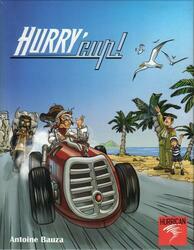 Hurry slowly... At the wheel of your Car, your objective is simple: to cross the finish line before the others! This requires reflexes and dexterity, optimizing your speed in tight turns and using all your trump cards wisely. Each lap, observation and speed will be put to the test to grab the gear lever corresponding to the die allowing you to optimize your movement and take the lead in this unbridled race. An easy game, quickly learned, with which we have a lot of fun. The circuit composed of 36 parts, allows millions of possibilities. The high quality material is resistant and durable. Contents of the box : 1 cup, 6 coloured dice called Reservoirs (fuel), 18 trump tokens, 6 pawns of 6 colours, 6 Star tokens, 1 wooden dice called Accelerator, 1 Red Lantern token, 6 cars.